Good day dock. My wisdom teeth are growing right top is not perfect (and the sloping wall of the cheek). I feel pain in the teeth right area (top and bottom) to painful to swallow and fever. I have yet to see a doctor because it is still in a state of 5 months pregnant. I want to ask, what's the solution? What are the risks if my wisdom teeth removed and not removed through surgery? Is it harmful to the nerves in the area? Thank you. Previously, I explain first about when wisdom teeth should be taken through surgery (surgery), when it does not need to go through surgery. Wisdom teeth surgery is required when the repeal is not possible with pliers, fail, or if the tooth hidden. Instead, wisdom teeth can be lifted without going through a surgical procedure if the position of the teeth is not buried and possible revocation of the pliers. You do not have to worry about such risks. Dentists are trained to avoid or overcome the entire risk. Currently, you can consume a dose of paracetamol with the lightest to relieve pain and amoxicillin as an antibiotic, you can get the recipe from Dentists or your gynecologist. Then ask your obstetrician, if your condition is contraindicated or not to do wisdom tooth extraction. If you think he should do the action, then you can directly go to Oral Surgeon Dentist (Drg., SpBM) for further action. 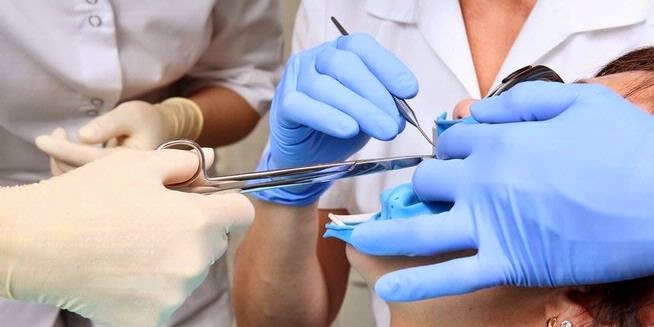 The determination of whether revocation of wisdom teeth surgically or not, it was decided after clinical and radiographic examination by Oral Surgeon Dentist. Thus Mrs. titin, hopefully useful information.